It’s 10th June, Richard’s birthday. We drive inland from Endeavour Falls along Battlecamp Road. The red dirt is back. The landscape has changed. It’s the opposite to the rainforest. The red roads gradually turn yellow as we drive through the low growing scrub and splash through the Normanby River creek crossing. Old Laura homestead still stands. A wide verandah tin and timber house, an old well, workers’ housing and the old forge remain. The house is protected with chicken wire, to keep out tourists and perhaps the wildlife. It must have been a hard existence living here in the heat, eking a living from the land. Steel grey ant hills dot the country as we drive on from Laura. This is national park land. New regulations require all campsites to be prebooked online or by telephone. This is bureaucracy at its best. It’s totally impractical in an area with no mobile reception, public telephones or wifi. It’s not in the spirit of bush camping to plan ahead and book the week in advance from Cooktown. Plans have to change when a closed road, a vehicle repair or a fascinating side track delay the camper. We shrug. We will look outside the national park for our spot tonight. The Kalpower River crossing is wide and flat, water tumbling down on the rocks below. We drive on corrugated public roads through aboriginal freehold land. The ant hills grow as tall as the scrubby trees. Sculpted and impassive they look like druids’ standing stones dotted across an ancient woodland. Wild horses gallop away as we pass. There are two options when we cross the Marrett River, through the water or on a rough timber bridge, a few tree trunks slung across bank to bank. Taking the bridge, we wonder if it will be strong enough to take the weight of the car. Just to be sure we stall the engine as we cross and spend a few moments gazing down at the river, proving the bridge is strong. Olive tells us tales of the old Kalpower homestead that is nearby. It must be deep in the bush now, because our search is in vain. There are no signs of habitation except an old Bedford truck that gave up the ghost many years ago. Further down the road,a muddy four wheel drive approaches us, containing two young men. Don’t bother trying to get to Bathurst Heads, they say. They have been bogged down in a mud hole for three days and have had to winch themselves out. The road is impassable. We make do with a campsite just off the road, towards the river. It’s a rough, scrubby spot. Max heads off to the river to fish. We make camp and get a fire started. Richard, Dom and Beryl head down to the river to see how the fishing is going. Richard, axe in hand, ready to fight off any crocodiles who may make their home here. This morning we heard a crocodile story from the owner of the campsite. A man was fishing in the river near the campsite and was grabbed by a four metre crocodile. They had never seen one in that area before. Male crocodiles have to find their own territory and move out into new areas as the population increases. Luckily, the axe is not needed. 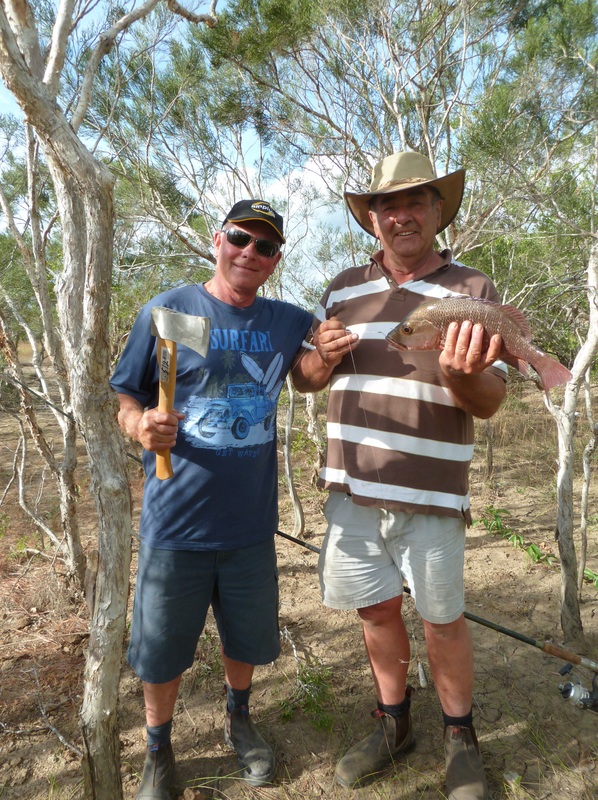 Max catches a lovely Mangrove Jack and a Bream, and Dom another Mangrove Jack. The fish are cooked on the campfire for dinner. The delicate taste of the fresh fish is better than any haute cuisine. The mosquitoes are vicious. Long trousers and sleeved shirts are essential. They force an early retirement to our beds, after a fine ginger beer scone dessert, cooked for Richard’s birthday by chef Howard. This entry was posted in Australia, Outback, queensland, Richard and tagged Australia, Outback, queensland, Travel on 16/06/2015 by Deb McSephney.